Not long ago I had the memorable experience of bowling in a league situation next to top senior bowler Ron Mohr. Aside from marveling at the incredible score of 1085 that he shot that day (when you watch a top pro bowler bowling on a Typical House Shot, you can really see how easy we house bowlers have it), I noticed the way he was playing the lanes. Despite the fact that the league is one of the top senior leagues in the area and attracts most of the high average bowlers, a great majority of them still play the 2nd arrow. Ron started at the 3rd arrow and had moved almost to the 4th by the end of the last game. I asked him about his decision to play the lanes so totally differently than the typical house bowler. He told me he knows most house bowlers play to the right and it was his goal to stay inside of them. He said, “I practice that shot a lot, even when it’s not there. I try to open up the lane for myself.” If you would like to learn to play more inside lines despite the fact that you are not a high rev player, read on. There are five things you have to do to learn this valuable skill. Please note this article is written from the perspective of righthanded bowlers since, in most cases, it’s righthanders who are required to make moves to find fresh oil on the lane. The same principles will work for lefthanders, should they need it. Modern bowling balls will find the track friction to the right and come back all by themselves. They don’t need any help from you. Besides, soon after the lanes burn up at the arrows, they also burn up at the breakpoint, which means you don’t have to go so far out. That means you can keep playing your straighter line and striking. Shortly after the PBA animal patterns were introduced, I bowled a PBA Senior Regional event in Flagstaff, Arizona. We were bowling on Scorpion which is known for the development of an out-of-bounds area as play progresses. By the 6th or 7th game, the out-of-bounds area was all the way in to the 3rd arrow. In other words, if your ball got outside of the 15th board at any point on the lane, it would miss the headpin right. If it got outside the 10th board, you were most likely looking at shooting a full rack for your spare. There was a bowler to my left who threw one of the most memorable games I have ever seen. He shot 279 playing the 4th arrow and never getting the ball outside the 15th board down lane. This was not unusual except for the fact that this bowler was not the usual “cranker” used to playing a line like this. He was a low rev player who relied not on power, but on accuracy, to play that inside line so effectively. I’ve since become friends with Terry Leong. I remind him about the PBA telecasts where the announcers talk about “ten in the pit” where that day his game was “three on the deck!” Terry has used his accuracy and ability to play inside lines and become a senior bowler with a reputation to always be a fac – tor in tournaments including the Senior U.S. Open and the Senior Masters. Often when house bowlers move their feet left, they walk directly back to their comfort zone at the 2nd arrow. This has two negative effects. First, you really haven’t changed your line much and second, as you walk farther right, your armswing is no longer in line with your target, so you tend to come over the top of the ball, losing power. In order to move inside effectively, I believe it is imperative you walk straight to the line regardless of where you are on the approach. See the Walking Straight drill. Whether you are playing the 2nd arrow, the 3rd arrow, the 4th arrow, or beyond, you can only roll the ball in a straight line. The physics of the ball makes it hook. To understand your line properly, you need to evaluate how you throw the ball in the comfort zone of the 2nd arrow. Second, note your target at the arrows and your intended breakpoint down the lane. If you are bowling on Brunswick ProLane, you can use the dark tracer boards down the lane. For the next step, have someone watch and tell you the location of your ball as you release it over the foul line. This is your laydown point – the point where your ball first makes contact with the lane. You now have all of the information you need to learn to move inside. Let’s look at a hypothetical example. We’ll say that, for you, the laydown point is ten boards right of the starting board. To play the 2nd arrow, you stand with your left instep along the 22nd board. You lay the ball down on the 12th board. Your shot crosses the arrows at the 10th board and goes out to the 8th board at the breakpoint. Your normal line is 12 to 10 to 8 when playing the 2nd arrow. So what happens when the lanes break down and you must migrate to 3rd arrow? You already know your laydown point is ten boards right of your starting board. If you are making a totally parallel move with all three points of your line, then you will be standing with your left instep along 27th board, cross – ing the arrows at 15, and throwing to 12 at the breakpoint. So what happens, you ask, if the breakpoint hasn’t moved all the way in to 12, but is now at the 9th board? You simply draw a line back from the 9th board to your laydown point, which is now the 17th board. Where does that line cross the arrows? That’s your new target. Since the new line is a slightly larger angle, you simply open your hips and shoulders enough to accommodate it, being careful to walk straight. In other words, your feet still move parallel with the boards on the approach, your shoulders and hips face your intended line, and your armswing is parallel to it, perpendicular from the angle formed by your hips and shoulders (see In Line Angles diagram). Your armswing adjusts to the new angle. The direction of your feet do not. If you are starting on 27, you should be sliding to 27. In Line Angles: As you move left on the approach, open your hips and shoulders to project the ball right. 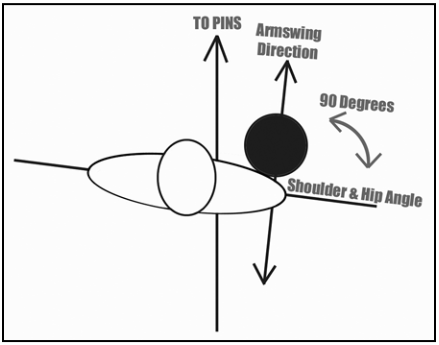 Notice the feet move in the direction of the pins, while the armswing moves in the direction of the intended target (perpendicular to the shoulder/hip angle). Make sure you don’t help the ball even when the angle becomes large enough you are afraid it won’t make it back to the pocket. Simply change to a more aggressive and earlier-rolling ball that will react more to the friction and turn harder back to the pocket. To do this, you will probably have to change your mind set about your arsenal. A common carryover from pre-modern bowling days is that you start with the most aggressive ball you can and change to a less aggressive ball (ball down) as the track area breaks down. This is a common way of insuring you never leave the comfort zone of the 2nd arrow. What would happen if you started with a less aggressive ball to take advantage of the friction outside on a house shot and changed to a more aggressive ball as you migrated left? Wouldn’t the strength of the ball “bring it back” without you having to help it? If you are not a high rev “cranker,” you will probably reach a point where you can no longer stay inside the power players. That’s okay. When you reach that point, you can once again begin to “ball down” to less aggressive equipment to play a straighter inside line and take advantage of the oil that remains on the mid part of the lane. Although high powered players are crossing it, you can play more direct to take advantage of it. It used to be that moving on the lane was a fairly routine proposition. The idea was (and is) to follow the oil line to give yourself maximum miss area to the left and right of your intended target. Moves were simple. You either moved two left with your feet and one left with your target or two left with your feet and two left with your target. If a really big move was required, it might be three with your feet and two with your target, but that was about it. The reason for this was simple. Most bowlers played “down the boards,” keeping their line to the pocket roughly parallel with the boards on the lane. Another reason was that bowling balls were not nearly as powerful as they are today and the covers did not absorb oil like the covers of today. With modern equipment and a great diversity of styles and rev rates, bowlers are not all adjusting the same amount or at the same time. It is not uncommon to find traditional bowlers playing the 2nd arrow by laying the ball down on 13 and going to the 8th board at the breakpoint on the same pair of lanes with high-powered contemporary players who are laying the ball down on 18, crossing the arrows at 15, and going to the same breakpoint at 8. Let’s consider this particular scenario and see if we can predict what will happen to the traditional player’s line as the games progress. As his line begins to change, we can predict he will have to move his feet to the left a couple of boards, moving his laydown point to 15 and his target to 12 to reach the same breakpoint at 8. A few frames farther on, he may find himself having to move again – laydown point to 17 and target to 13 to reach the breakpoint at 8. Things are fine until the next move when his laydown point, his target, and his breakpoint are all right on top of where the contemporary player started (he’s long gone by now). To prepare for this eventuality (and anticipate it), you have to be aware of where every bowler is playing in terms of laydown point, where the ball is crossing the arrows, and the breakpoint. By being aware, you will know beforehand how far you will have to move to get left of other players or what kind of ball change you will have to make to compensate for playing the same part of the lane someone has already played. Once you have mastered these five changes to your game and become comfortable with them, you will find your bowling has reached a new level. Not only will your league average improve dramatically, but you will be able to easily adapt to tournament conditions where playing different parts of the lane is not only preferable, it is mandatory. To learn to walk parallel to the boards regardless of where you are on the approach, try this drill in practice. Put a piece of tape about a foot over the foul line on your laydown point as you are playing the 2nd arrow. Throw a few shots looking at the laydown target as you approach the foul line. Once you are comfortable doing this, move both your feet and the tape five boards left. Again, practice throwing the ball as you are looking at your laydown point. Repeat this process until you have moved all the way to the left gutter. As you become comfortable at each position on the approach, be aware of your angle down the lane, from the laydown point to your target at the arrows and finally to your breakpoint. Practice opening your shoulders and hips slightly to keep your armswing going in the direction of your intended line, despite walking straight to the foul line. The idea of this drill is simple: if you concentrate on laying your ball down on the correct spot for the line you are intending to play, you cannot possibly walk to the right and still hit it. Once you have practiced this drill and adjusted your attitudes, you will find that a whole new world of bowling has “opened up” for you (please pardon the pun). Good luck! Image credit: Bowling ball graphic (©iStock.com/Maestria_diz) and bowling lane image (©iStock.com/tarasov_vl) are licensed for use by BTM and are the copyrighted property of their original creators.